Chicken lovers will find Korea a paradise with its myriad of fried chicken establishments, and all their interesting variation. This explains how even Korean fried chicken establishments such as Bonchon have successfully made way overseas and even in the States, birthplace of Colonel Sanders' KFC. Tucan, located along the main Kyunglidan strip of Noksapyeong, stands out from other chicken places for offering an uncommon chicken dish in Korea- jerk chicken. The free-spirited owner of Tucan spent time in Central and South America, proudly displaying pictures and mementos from his time there. He even has recreated the traditional oil barrel cooking pit jerk chicken is commonly cooked in, though it doesn't seem to be in use all the time. The colorful interior certainly stands out from the mostly darker neighboring establishments. Seating is limited at perhaps 20 or so available seats (including a few outdoors). 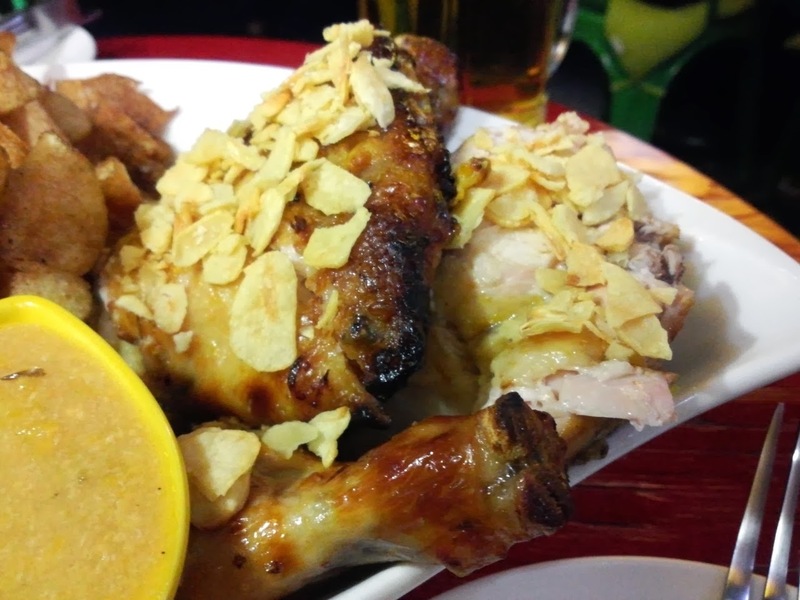 Menu options for chicken is limited to two choices between the orange chicken and the jerk chicken. You have the option of ordering half a chicken, a full chicken or even half orange and half jerk chicken. Pricing is steep, especially for a chicken establishment in Korea, with a full half and half chicken coming out to 23,000 won. The half order is about 13,000 won. Other unique Caribbean sides on the menu include a mango salad (10,000), potato chips (8,000), rice and peas (3,000) and coleslaw (3,000). Fried plantains were also said to be coming soon. Three of us put in an order for a half and half chicken and a few draft beers. The chickens definitely came from the ovens indoors and took a good 8-10 minutes to come out. 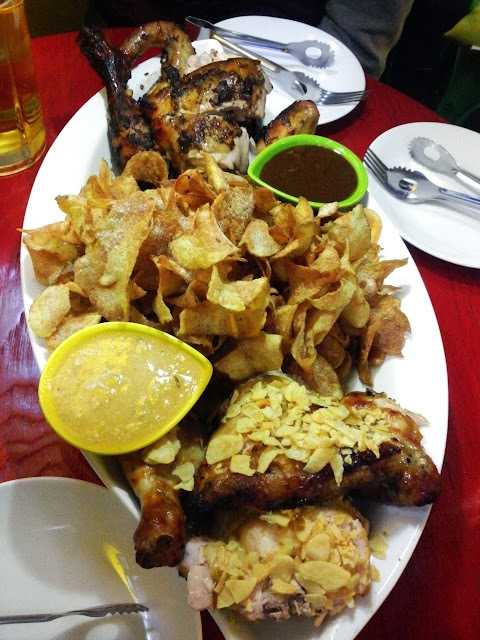 The full chicken is enormous and very plump with meat and comes sitting on a bed of spiced homemade chips. While most neighborhood fried chicken places utilize smaller chickens, the birds at Tucan looks like they're on steroids in comparison. The jerk chicken is visually a stunner with the grilled up and blackened jerk spices bedecked over the beautifully golden crispy skin. The jerk spices are a nice flow of flavors from sweet to smoky and with a very, very subtle kick. Being a grilled chicken, I was surprised at how moist the inside of the chicken was. The Orange Chicken (unrelated to the popular American-Chinese staple) was also a looker, coming in a gorgeous golden color with visibly crispy skin and flakes of real garlic chips on top. Unfortunately taste-wise it was a letdown. You can catch an ever-so-slight hint of the orange marinade but it's probably what a chicken would taste like if you roasted it after giving the skin a slight baste in orange juice. Sure, the chicken was moist but at its price, you got more flavor for your hard earned Korean won with the Jerk Chicken for sure. The order came with two dipping sauces which are simply the respective chicken's wet rub marinades. 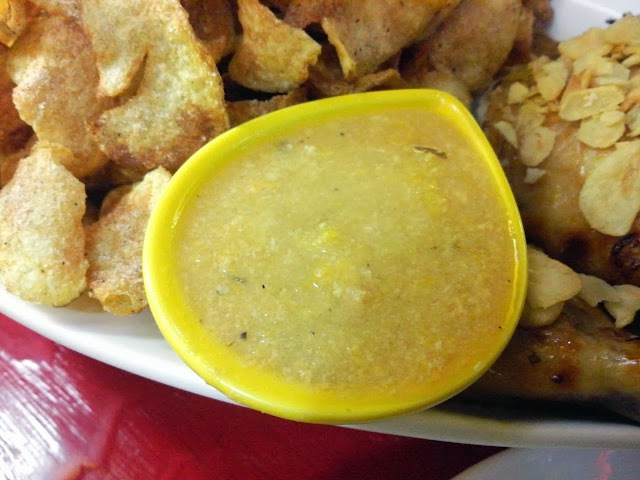 The orange sauce has a sweet and tangy taste but surprisingly little hint of orange. It was respectable but unmemorable. 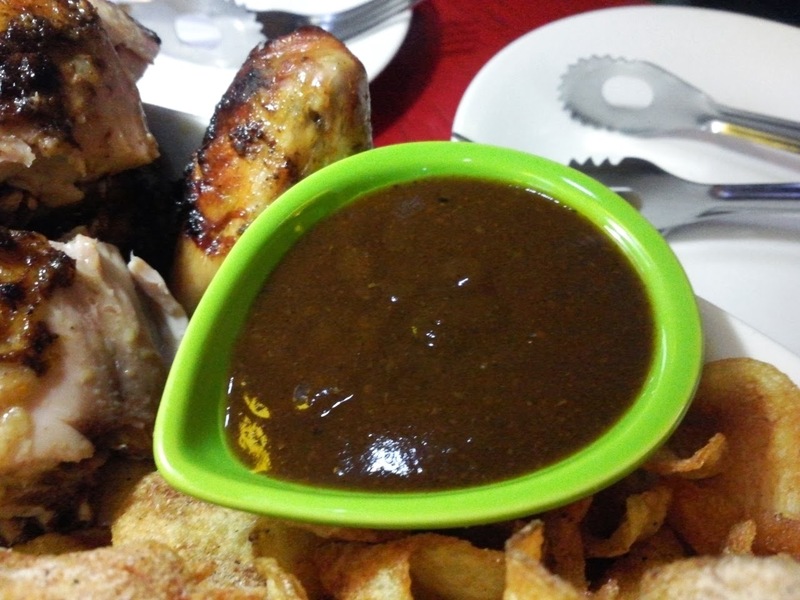 The jerk sauce was definitely the winner for our group and some of us were repeatedly dunking and smothering the plump chicken meat into the sauce and asking for refills. The smoky taste made it a real winner and reminded me of a sweetened A1 sauce. At one point, after asking for a refill of the jerk sauce, the staff let us know they had run out and were working on the marinade. Being an open kitchen, I was able to see the owner himself whipping up a batch of the marinade himself with the spices and other ingredients so it was nice to see the sauces and marinades weren't made prior or from a bottle. 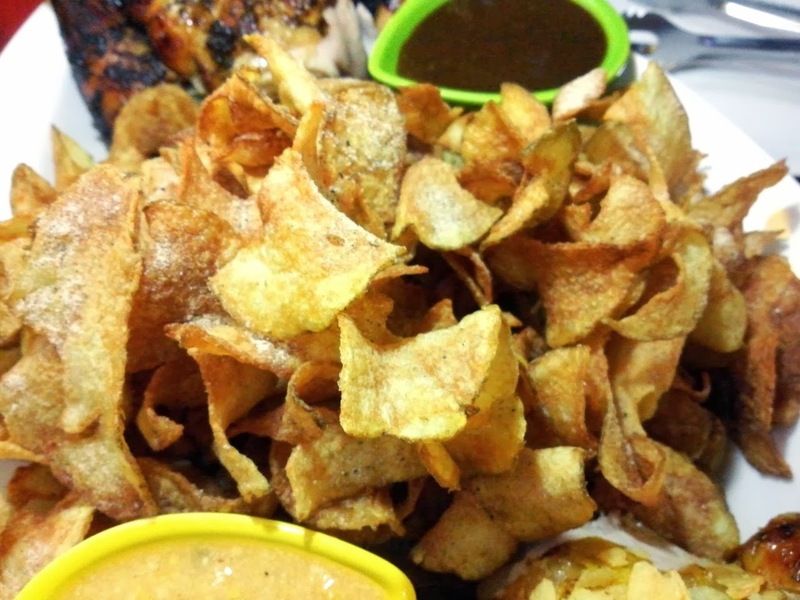 The enormous mound of potato chips underneath the chicken comes dusted in some of the jerk spices. At first taste I was a bit disappointed but they were strangely addicting with the subtle sweet and smoky spices. I found the chips a bit overcooked, however, with a slight burnt aftertaste. 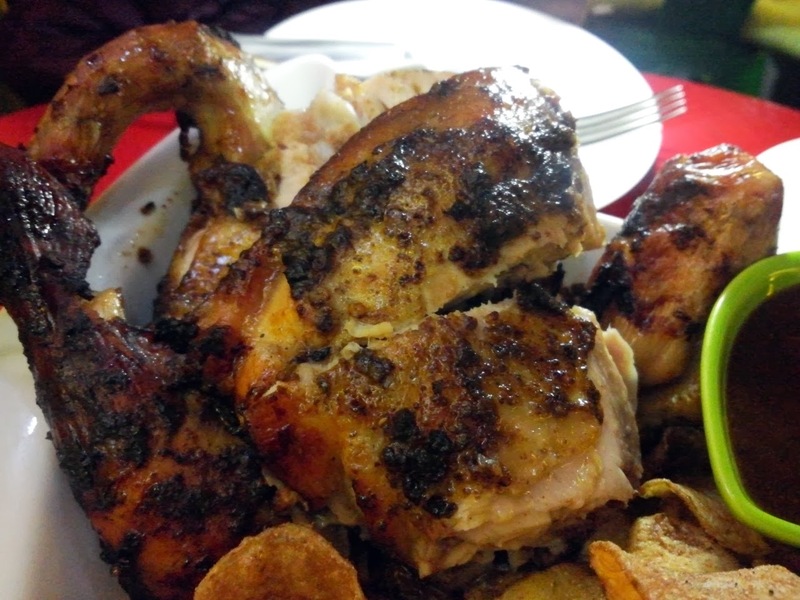 This was my second time visiting Tucan and in both cases I walked out with the same conclusion: The chicken is nice and fat, it's grilled well and manages to keep the insides moist and juicy and the jerk chicken has some wonderful spices to it. But for all its merits, I can't help but think shelling out 23,000 won is too damn expensive for chicken. Granted, the chicken is big and the spices are homemade but when you can get chicken around your hood in Korea for 13,000 won does the bigger size and spices justify a 10,000 won difference? I'm erring on the side of "not" so far. To put it succinctly, go for the jerk chicken if you're really craving the jerk or if you want to try it for the first time but skip the orange chicken. However, I don't think even the jerk chicken, at its current price, has the draw to bring in multiple visits within a short time frame. Tip: As I mentioned, the whole bird is a whole lot bigger than your average chickens in Korea. It could easily stuff a group of 3-4 individuals. If you're just a party of two and don't want to carry around leftovers, a half bird should suit you fine.